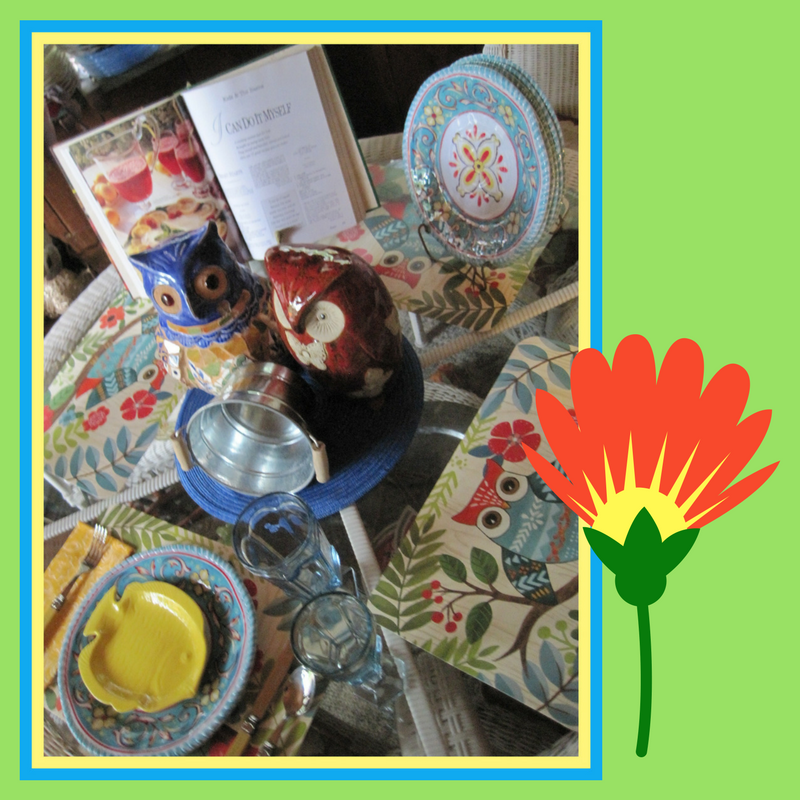 I think you are going to see these melamine dinner plates from Big Lots ... in several posts this summer. 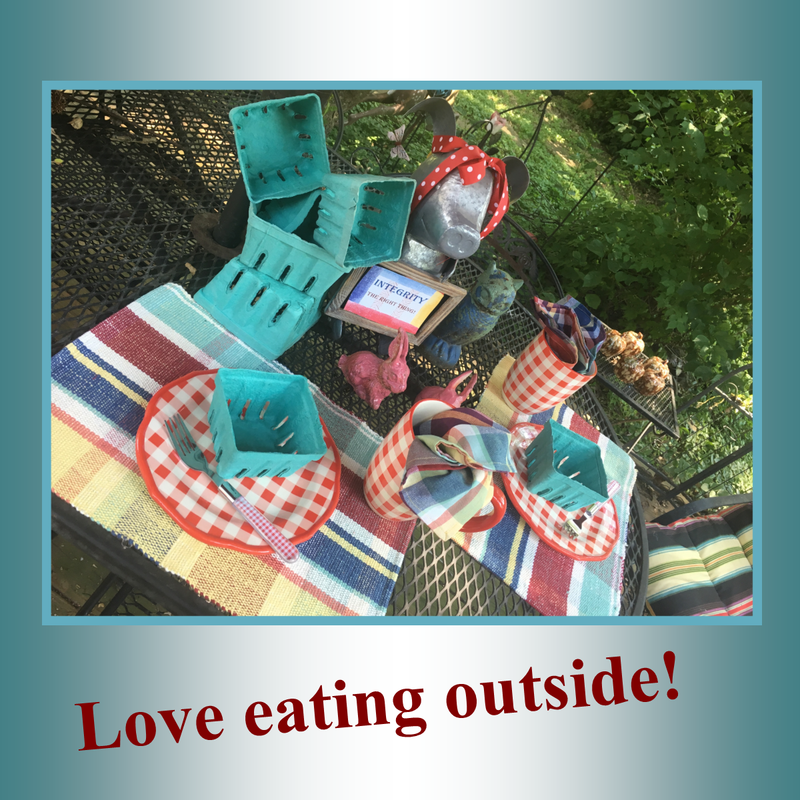 They seem to look great with lots of tablescape themes and I keep them out all the time so they are handy to grab when I'm playing on the back deck. This morning of scaping began with this set of cute place mats! You're going to see them again on a different day! Flowers, flowers, flowers! I always hang a wreath in my cherry tree that is right beside the back deck! This summer, I'm using a lighted wreath that includes red geraniums, but I add lots of other flowers to it as the season progresses! These napkin rings came from Pier 1 ... years ago! I've had them several seasons. The napkins came from Pier 1 a couple Easter seasons ago! Don't you love the stitching on the hems? Other than roses, I don't grow flowers to cut. In fact, if I keep flowers in pots going all summer, it is just good luck and mild temperatures! To have been raised by an expert gardener, you'd think I could grow flowers. Not true, but I love clipping grape leaves, pinching a few petunias and adding a little other trailing greenery ... and filling tiny vintage vases! 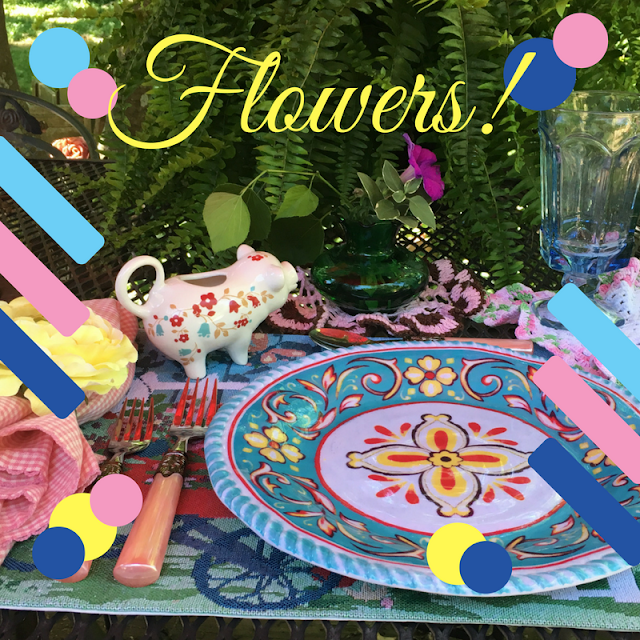 My tablescape is a hodgepodge! 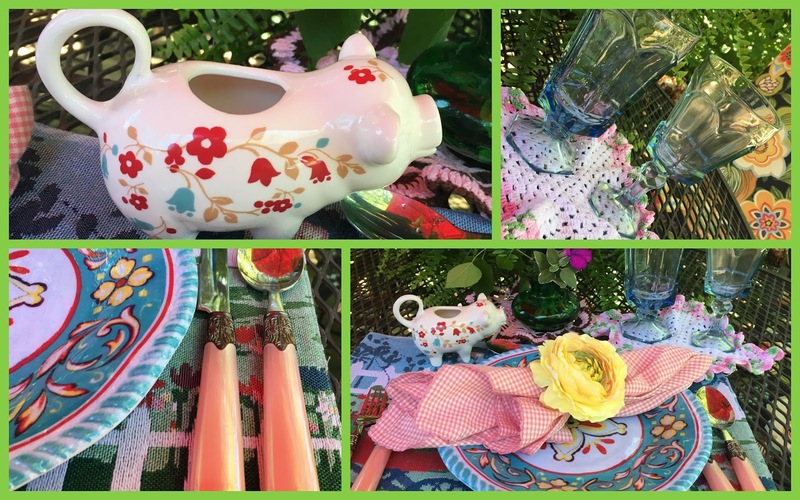 Old and new ... and if you follow me you know I like to include pigs in table settings. 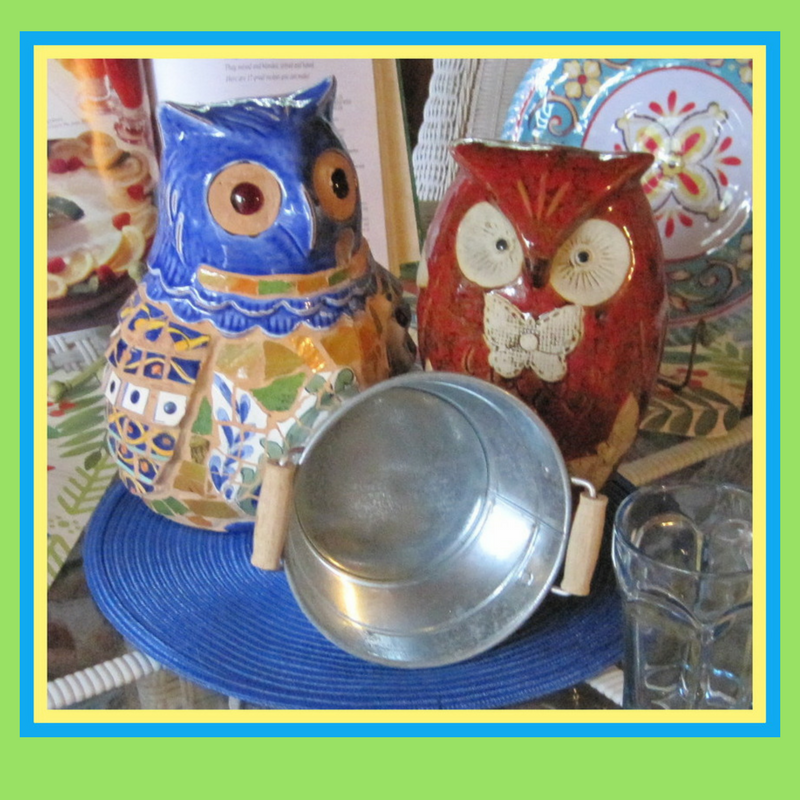 I have enough of these cuties to put at each place setting, filled with homemade salad dressing! The flatware is 20 years old and glassware is 30 plus years old! I have trouble parting with stuff! I'll probably share this with a few parties on my sidebar, so make sure you click through to see the other posts! 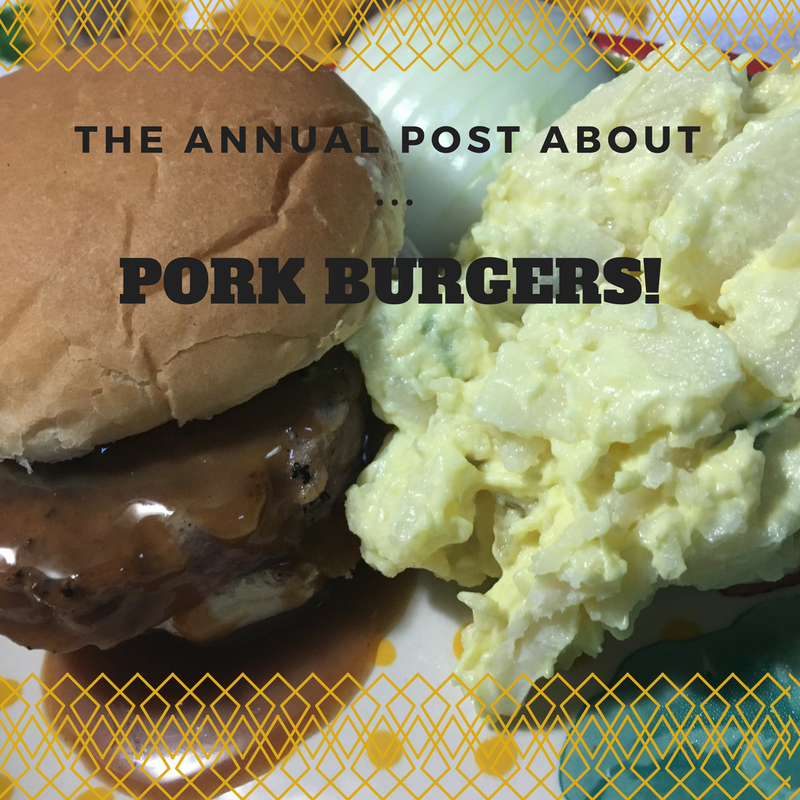 The Annual Pork Burger Post! My annual pork burger post is usually about how ground pork is cheaper than ground beef ... and how I love to buy 5 pounds, make and freeze patties. Well this year is a little different! My Phd. 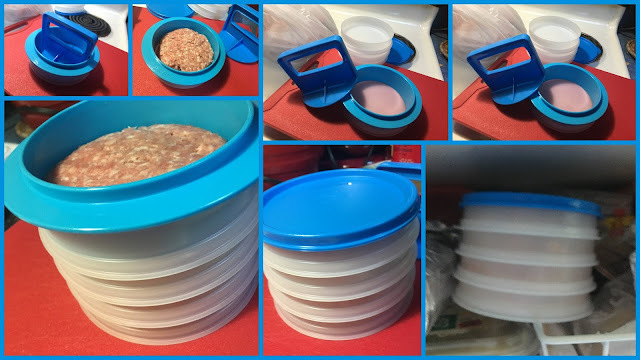 daughter has started selling Tupperware! She need something new in her life and wants Phoebe to learn about running a business and earning money. Sometimes it is hard for children to learn those lessons without a real experience! This is working perfectly for them. Of course, I've bought things I don't need ... but I decided I would really use this burger press and storage containers. I LOVE THIS SET! I've pattied thousands of burgers in my cooking life, but these perfect patties cooked faster and shrunk less than any I've ever made. Something about the pressing and the size. The storage stack is fantastic, too ... and the frozen burger pops right out and will thaw in 30 minutes. Dr. Tupperware Lady is on to something! People love their products because they last forever! I'm not having trouble spending money! I recently had some polenta left from another meal, so I stored it in the fridge a couple days and grilled it for supper. I had added smoked gouda walnut spread to the polenta before I stored it and that made it extra good. 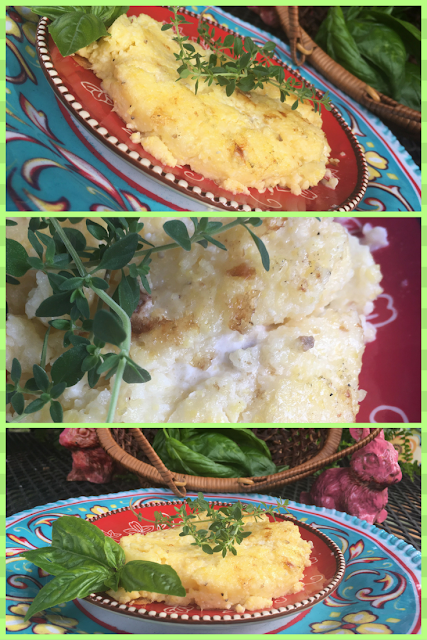 Fresh basil and thyme made it even better! I'm trying to spend a little more time at the stove or BBQ grill lately. It is just not easy to cook only enough for one person, so I have to work at preparing small portions! I need to eat my own cooking, and I love cooking for crowds, but when it is just for me ... the quicker I get done, the better. 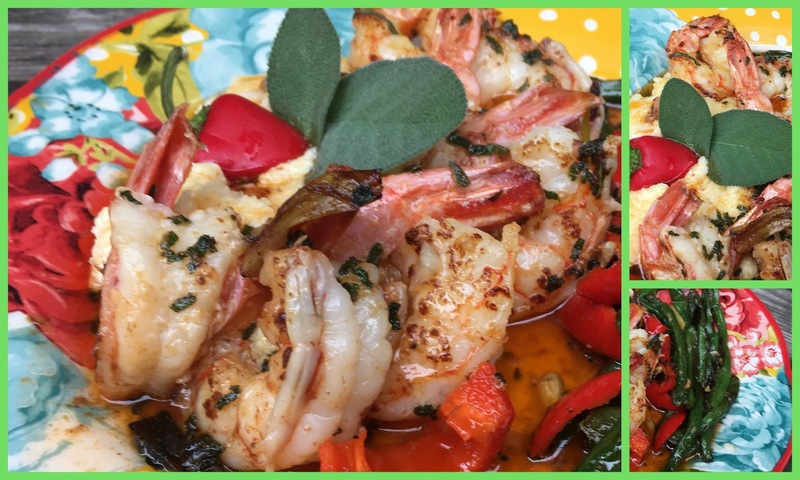 Believe it or not, this shrimp dinner is a 30-minute meal! After peeling, deveining and washing the shrimp, I pat it dry with paper towel. While doing that, I've set a small pan of water to boil for my polenta (3 parts water to 1 part polenta). Once the water is boiling, gently pour in the polenta; turn the heat down and let the polenta simmer until it is done. Stir it occasionally. I make the rest of this meal in one skillet, starting by quickly 'scalding' the fresh green beans in just a tiny bit of butter. I season my beans with salt and pepper. Before the beans were ready, I tossed in a small sweet red pepper, sliced. When my vegetables were crisp, but done ... I removed them and added a Tablespoon of butter to the skillet, letting it melt slowly. I added my shrimp and fresh sage leaves (chopped). 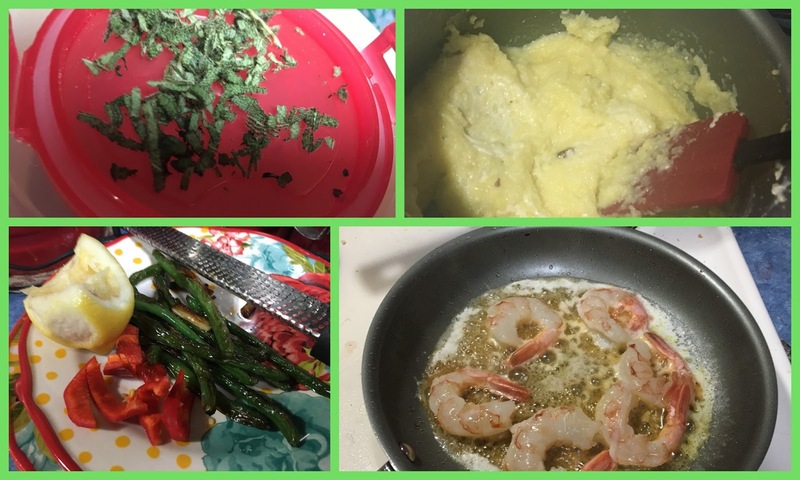 I generously dropped fresh lemon zest over the shrimp. 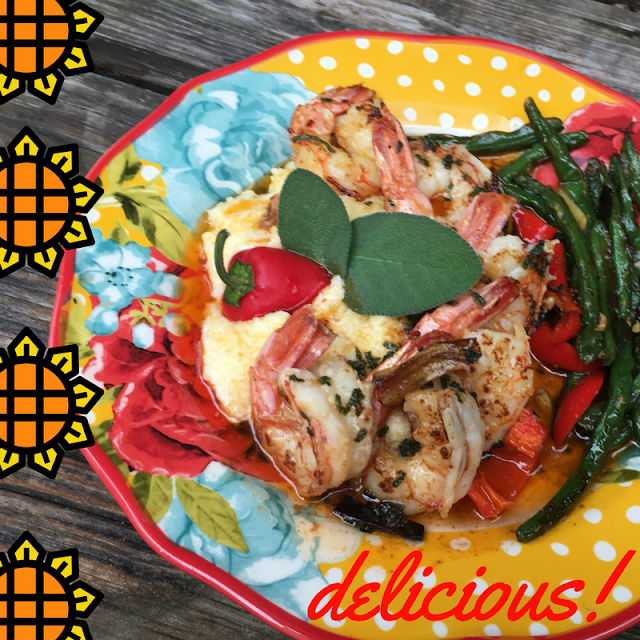 Once the shrimp started turning translucent, I turned the heat up high and quickly browned the butter and the shrimp! I immediately served the shrimp over the polenta. If you don't quickly removed your browned butter sauce from the skillet, it will become blackened butter sauce! The last step is a good squeeze of fresh lemon juice! Delicious! 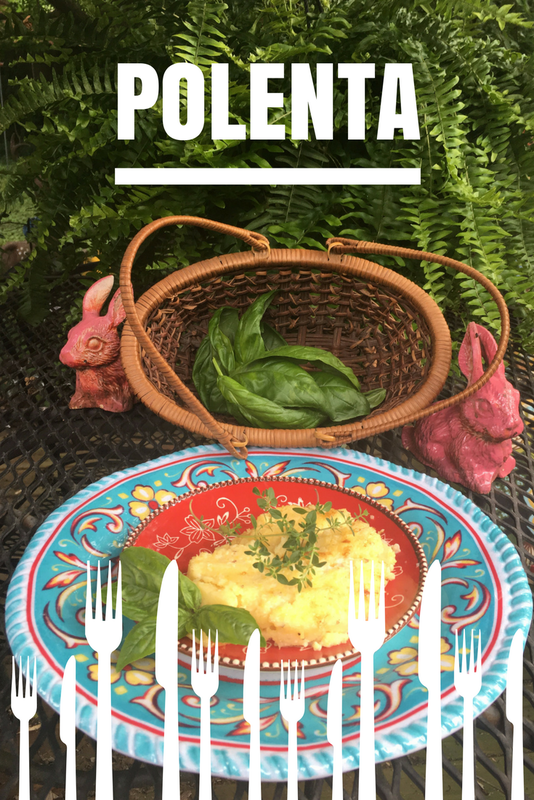 I always have left over polenta and it is good in many ways. I added a couple spoonsful of smoked gouda walnut spread to the left over polenta and stored it in the fridge. Look at left over Grilled Polenta to see how I used it! 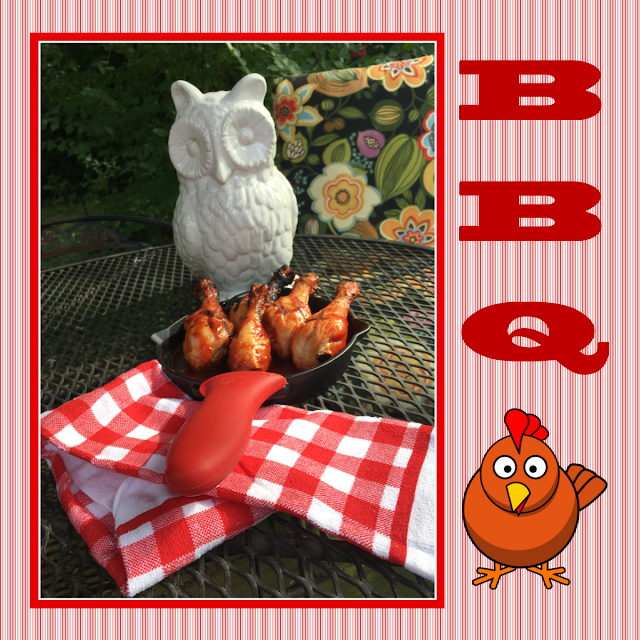 Who doesn't love BBQ chicken? Oh, I'm sure there are lots of folks who don't ... but I can honestly tell you that I don't know one! As an empty nest grandma, I cook for just one, so for a normal meal, I sure don't need to cook a whole chicken. Legs are my favorite pieces ... so it is a batch of legs that I will cook! 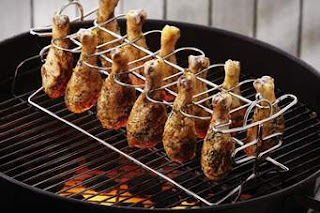 Several years ago, I bought a couple drumstick racks for the grill. They really make the job super easier. All you have to do is set the legs over medium heat, close the lid on your grill and let the legs cook for about 45 minutes. 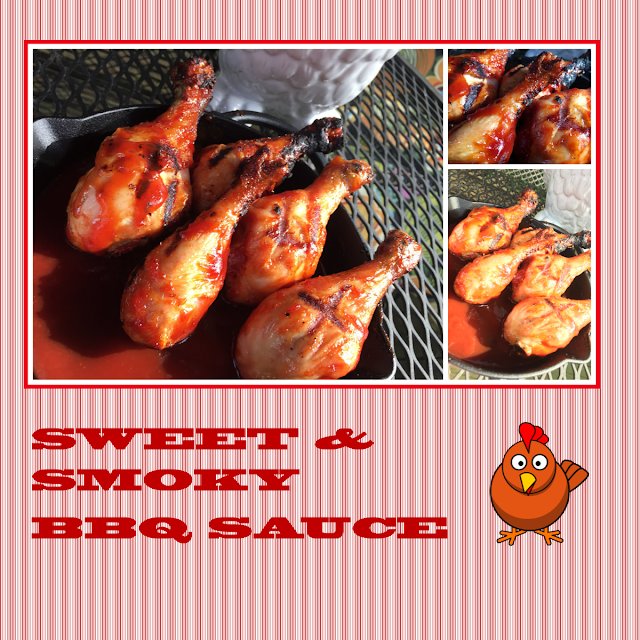 After they are done, I take them off the rack, dip them in my favorite BBQ sauce and place the legs directly on the grill, so the sauce gets thick and blackens a little. Why is this easy? Because all you have to do is turn the rack one time so the legs cook evenly on all sides. 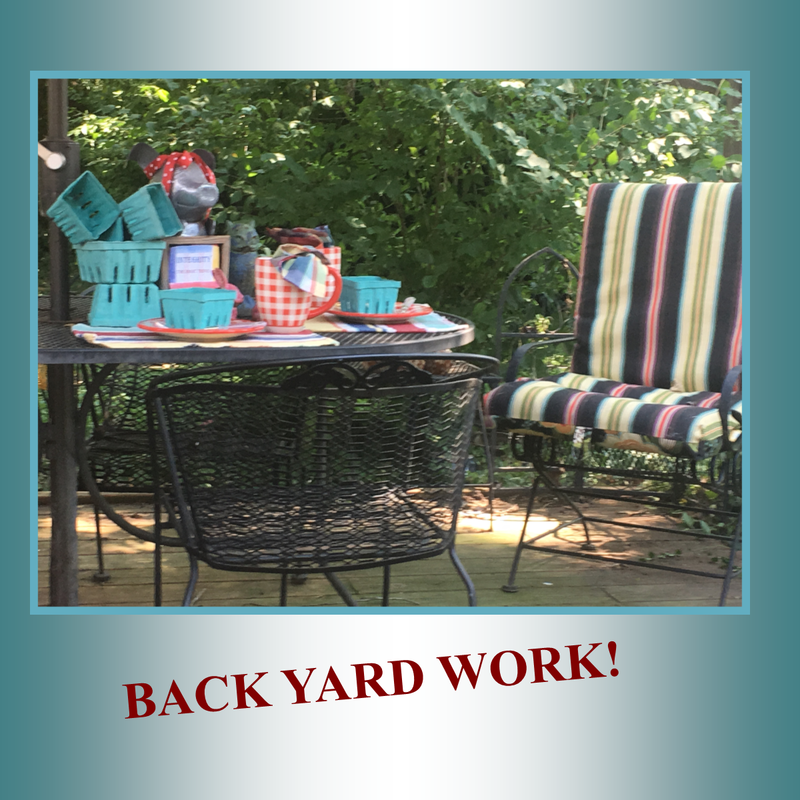 Other than that, you can go about the business of mowing grass, cleaning the kitchen or just sitting in the lounge chair, relaxing! 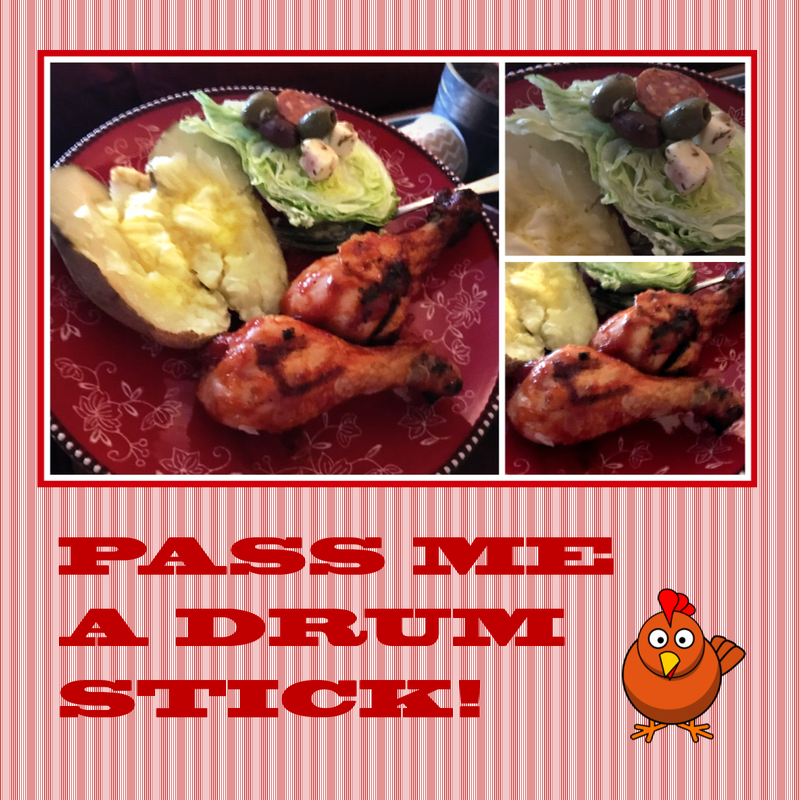 I served my drumsticks with a baked potato and an easy iceberg lettuce salad, topped with marinated olives, pepperoni and chunks of asiago cheese. I'll be sharing this post with a few parties shown in my sidebar, so make sure you click through to see the other posts! When I've had a busy day at work, I don't come home and cook for myself. I cooked dinner for 35 years, but now that I set just one place at the table, I don't see a real reason to do it. When I do, it better happen in less than 10 minutes, or I go right to the freezer for one of those little boxes! I am a fan of pasta with no sauce ... I like it sauteed in a little butter or infused olive or avocado oil! It just takes a tiny amount to give it a delightful flavor. So ... in 7 minutes tonight, I made one of my favorites ... 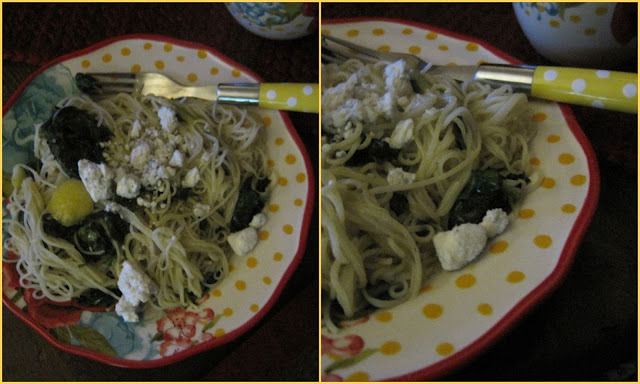 Spinach with Angel Hair Pasta! All you have to do is saute a couple cups of fresh spinach in a pat of butter ... while the pasta is cooking. I want a fresh flavor, so I only add lemon juice and a few pieces of lemon peel. Then I toss it all together after the pasta is drained and sprinkle on a few bleu cheese crumbles. It takes longer to clean up the dishes than it does to cook the meal! 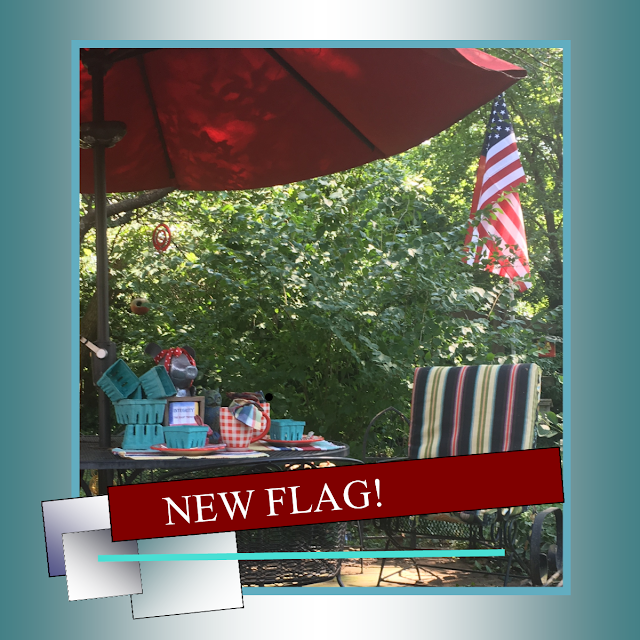 NEW FLAG & DONUT HOLES! It was time to do some serious back yard work and put up a new flag ... so I can properly dispose of the old flag at a Flag Day ceremony next week! Of course, a new flag was something to celebrate, so I had to set a cute snack table. I saved a few fruit boxes last summer, just to use for serving quick snacks. 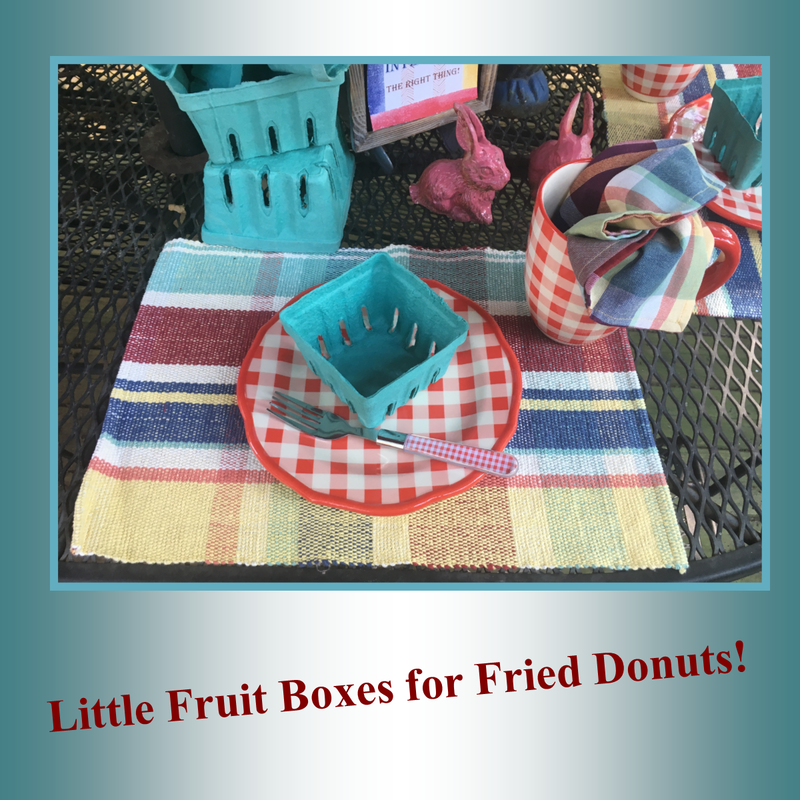 If you remember the days when real little woven baskets were used ... you must be at least as old as I am! I still have some of those from a agriculture basket factory that was located near our home. 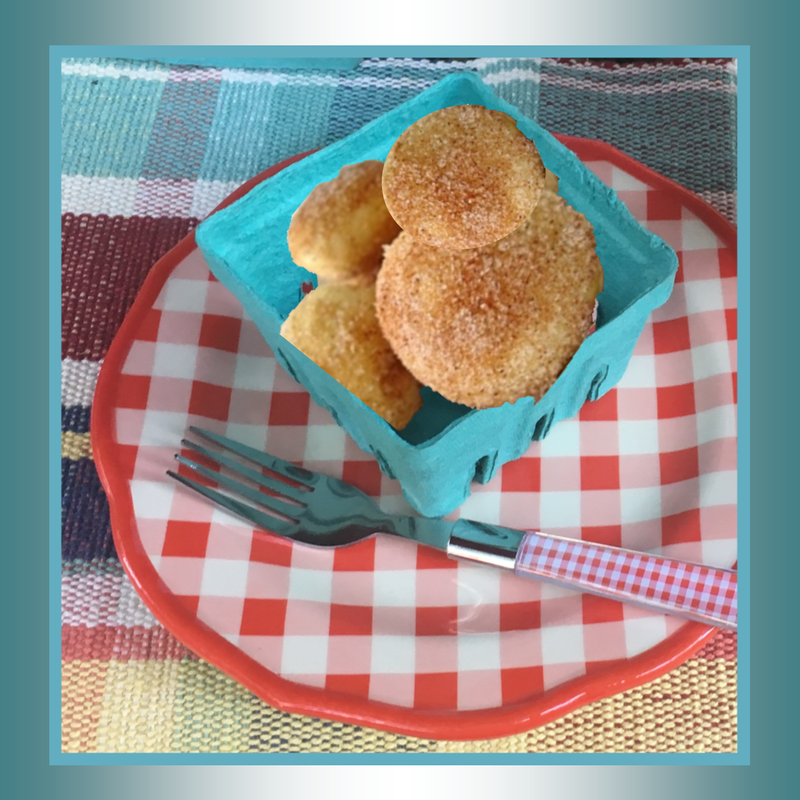 Our fried donuts always come right from a can of biscuit dough ... or from Angel Biscuit dough, if I have it in the fridge! 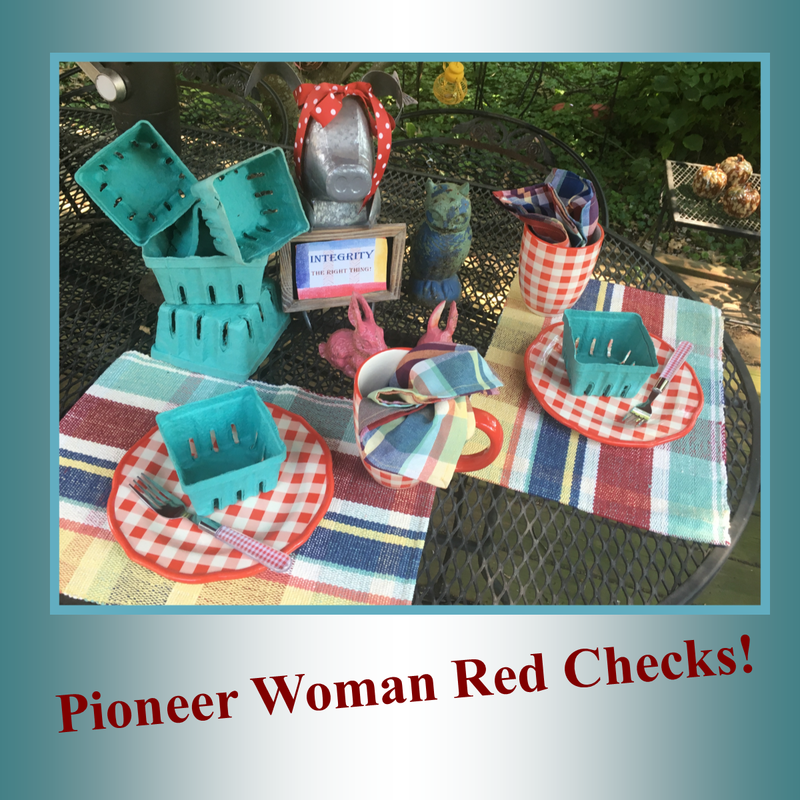 I'm afraid the Pioneer Woman got me again ... with the red checked dishes. I'm giving lots of stuff to charity this summer, so I am justifying a few PW purchases! My galvanized tin pig likes sitting on the table with some worn garden ornaments! 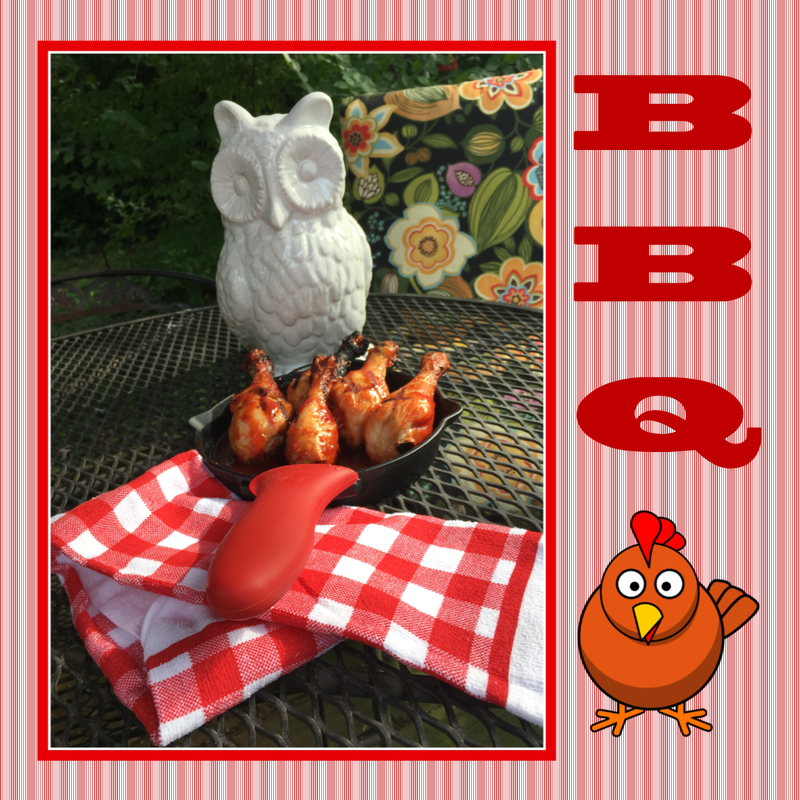 I might share with some of the parties on my sidebar, so take a look at the other posts! Have a great week! When Joe and I were first married, we bought a double A-Frame home that was located in the middle of a 40-acre stand of oak trees. Needless to say, owls found refuge in the timber ... and on one of our first nights there, a couple of them decided to make lots of noise! They were "courting", as my daddy would say ... and they startled us! Not long after, we shopped for oil paintings and Joe found the perfect painting to hang near the top of the 30 foot tall fireplace chimney! 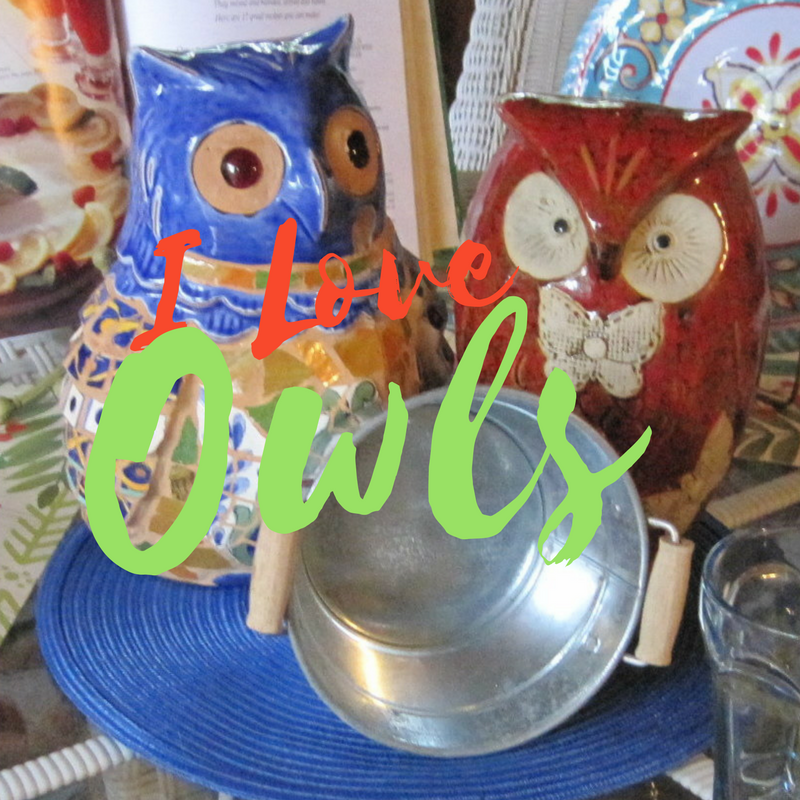 That beautiful painting remains with me, and if you want to see it, click right here to see the owl I've loved for 40 years. For now, let me share something else that is pretty cute! 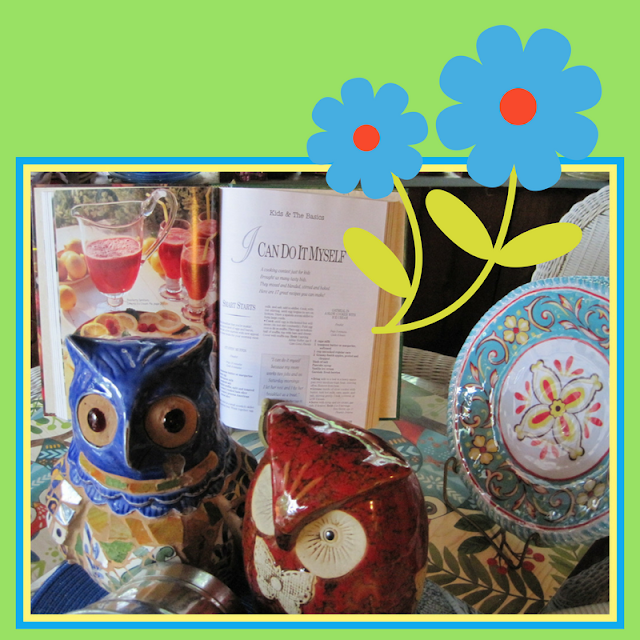 I moved a couple of my garden owls inside to create a tablescape in the sunroom! 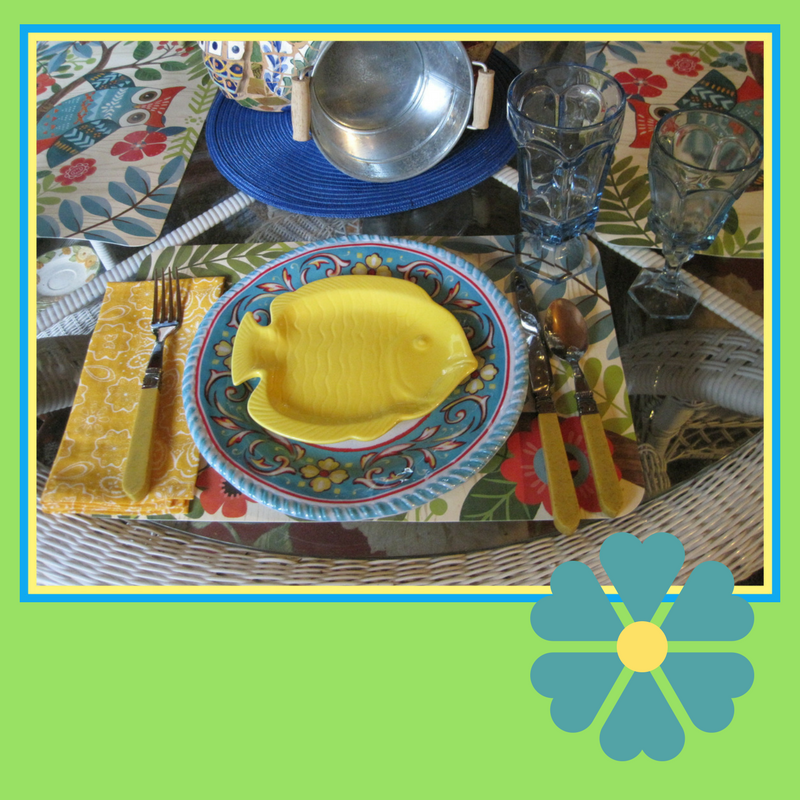 This tablescape evolved from a place mat purchase from Wal-Mart! I love this paper art style of design. I frequently use books ... especially cookbooks ... in tablescapes. I don't buy many cookbooks anymore, but I still love the ones I have. I enjoy their company at the dinner table! 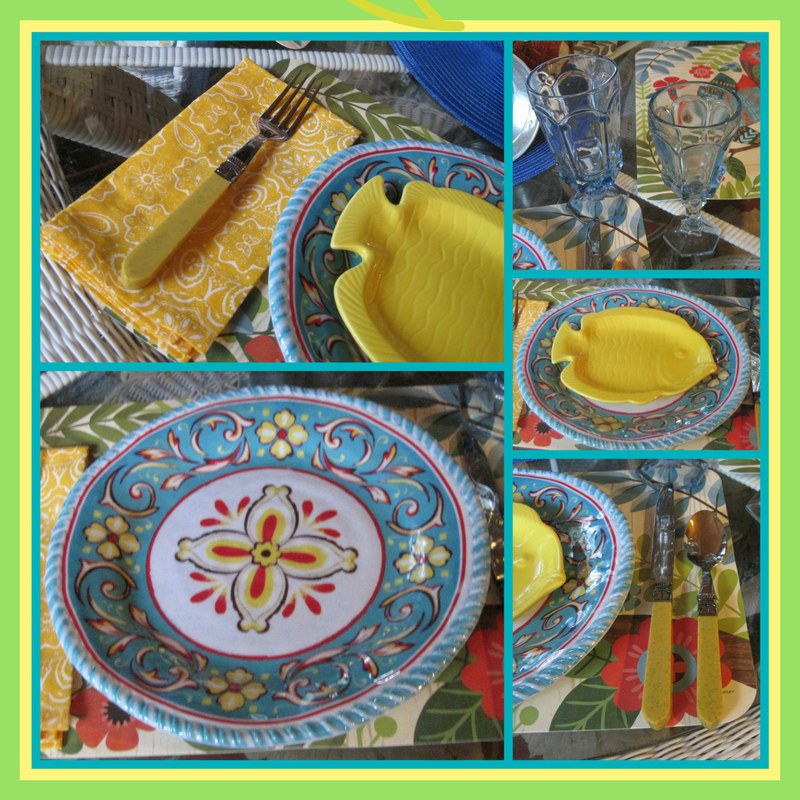 I splurged this summer for a set of Melamine plates ... a big $2.50 each at Big Lots! They set a pretty table. 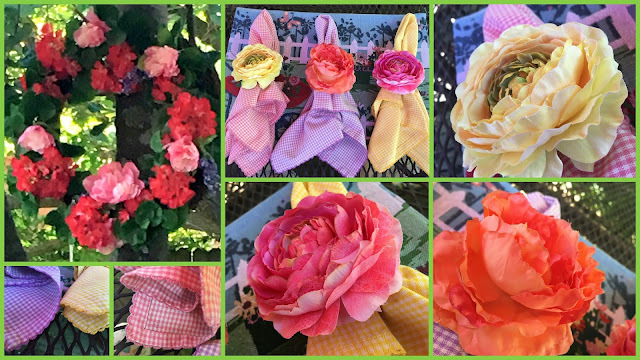 Napkins are Pioneer Woman and the glassware is Fostoria Virginia pattern from the 1980s.